Why is the momentum of a pully with two masses moving with velocity $v$ equal to $(m_1+m_2)v$ and not $m_1v−m_2v$ (as it would by vector addition of the momenta of independent/unconnected masses)? The Principle of Conservation of Momentum may be applied to bodies at the ends of a piece of string. We must regard the string-particle system as one body, like a long train going around the corner. Two particles of masses 4 kg and 3 kg hang from a pulley at the ends of a light inextensible string. The system is released from rest. After 2 seconds, the 3 kg pass picks up a particle of mass 2 kg. How much further will the 4 kg mass move downward before it stops? Two masses of 5 kg and 1 kg hang from a smooth pulley at the ends of a light inextensible string. The system is released from rest. After 2 seconds, the 5 kg mass hits a horizontal table: i. How much further will the 1 kg mass rise? ii. The 1 kg mass then falls and the 5 kg mass is jolted off the table. With what speed will the 5 kg mass begin to rise? I cannot reconcile the vector nature of velocity and hence momentum with this "going around the corner" business. Perhaps someone can explain this better than the textbook... or perhaps is the textbook incorrect? At this point the 3 kg mass picks up a 2 kg mass, to become a new mass of 5 kg. The system will immediately be jolted to a slower speed. This speed can be found by applying the Principle of Conservation to the particle-string system. The mass of this whole system was 7 kg before the jolt and 9 kg after the jolt. Let $v$ be the new speed. I don't understand how this is a valid application of the conservation of momentum. Let's look at the simple pulley system, i.e. no friction, inextensible string, no hitting of table, etc. Also, it is very important to realize that we only pull at the ends of the strings, i.e. we don't do any lifting of the masses. With these simplifications, the only purpose of the string is to make the masses move at the same velocity. For instance you could shorten the string and the system would work exactly in the same way. Also, you note that the only purpose of the wheel is to get two gravitational forces which allows you to play around with (more interesting than just dropping a mass in gravity). 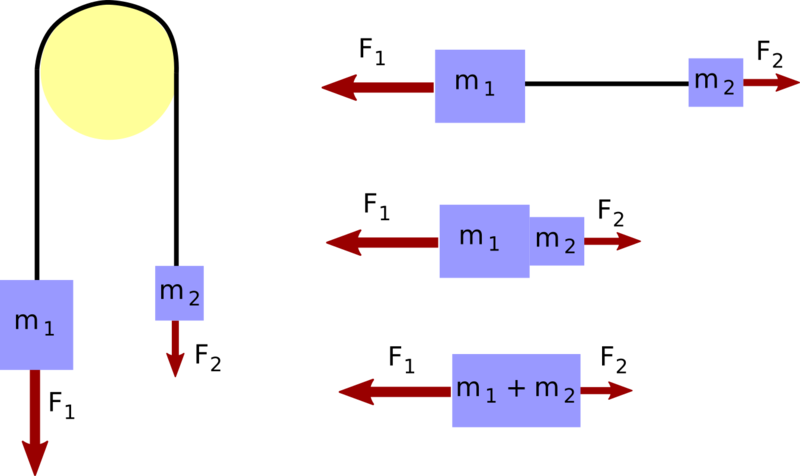 Taking this into account, the pulley is (for the purpose of simple pulley movements) completely equivalent to a straight string connecting two masses (or even two masses connected directly to each other, or even a single mass equal to the sum of these two masses) and you pull at this system at either end with the respective gravitational weight/force of that mass. So if you write the momentum of this system it will be just the velocity times the total mass, $p=(m_1+m_2) v$. There is no question about adding two momenta, because essentially you have one body only. Adding momenta like you suggest would only make sense if the two masses could move independently, which they cannot because of the conditions. In idealized physical systems like this one, you often run into apparent violations of conservation laws. Take for instance the perfect reflection of a ball off a wall, i.e. a reflection where the speed is conserved, but the velocity direction reversed. Apparently in this process the momentum changes by $2mv$, i.e. is not conserved. However if you study this system on a microscopic level you see that momentum is transferred to the atoms in the wall, etc, so that momentum is conserved. The term going around the corner here just means that there is conservation of momentum as this is a single, closed system. Momentum is $mv$, mass multiplied by velocity. Since the mass was added during the movement of the pulley, momentum is conserved. This means that the initial momentum, $m_1u$ is equal to the final momentum, $m_2v$. You have your answer. As mentioned above, momentum is $mv$. So the total mass is $m_1+m_2$, and velocity is $v$. However, since this is a closed system, momentum is built up instead of subtracted. The total mass, regardless of the ratio of masses on both sides, is still the sum of the mass of the whole system, so it is $(m_1+m_2)v$. Not the answer you're looking for? Browse other questions tagged newtonian-mechanics classical-mechanics energy momentum or ask your own question. Why isn't momentum conserved in this pulley problem? Pulley system. Why do I need to put a minus sign? Modelling implication of an inextensible string in a pulley system?